This is Waldo's 2nd book. His first book, "Saloons - Bars - & Cigar Stores" has been sold out for a long time. If you collect uprights or early trade stimulators then you should really consider getting this book. If you don't collect uprights but are into slots or trade stimulators or turn of the century American history then you should still get this book. There are incredible photos in it showing these early machines in the environment where they were actually used. The book not only identifies the machines in the photos but states where the photo was taken. For example, there are two photos showing the rare Mills Roulette. One is in, of all places, Nome Alaska!! The roulette is being tossed to the curb after a storm. There is also a photo showing "The Elite" by "The Royal Novelty Company". No surviving examples of this machine are known. Seeing these photos and seeing how people lived 100+ years ago made me appreciate how really privileged we are to own machines which somehow figured out how to avoid the axes. Another thing worth pointing out is the index lists not only machine names but also machine locations. Using the index, I was able to find a picture of a bar in Butte Montana which is the town that I grew up in. The price of the book is $65.00 + $6.50 S/H ($71.50 total) and can be ordered directly from the author. You can send an email to waldovan@sbcglobal.net for instructions on how to pay. He does accept PayPal. Copies of the photos that are in the book are also available for individual purchase. I am so impressed with this book that I am going to offer the following deal to everyone who purchases it between now and September 15th. 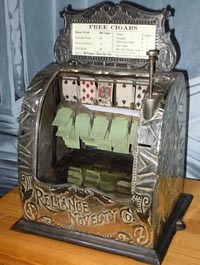 If you purchase the book I will give you a 14 day subscription to the online price guide ($39.95 value) OR 20 coin op referrals ($50 value) via the online price guide (http://www.AntiqueSlotMachinePriceGuide.com). If you are already a subscriber to the price guide I will increase you subscription by 14 days or if you are already getting referrals I will add 20 to your current allotment. If you are a member of the Coin Op Preservation Society (COPS) (http://www.CoinOpPreservationSociety.com I will TRIPLE the above offer (45 day subscription OR 60 coin op referrals). If you are not a member of COPS and want to take advantage of this offer simply join COPS ($20). Supporting COPS helps keep this forum, the price guide, and the coin op registry (http://www.CoinOpRegistry.com going. I am doing this as a favor to Waldo and not receiving any kickback or compensation from the sale of his book. If you want to take advantage of either of these offers just ask Waldo to send me an email with your email and I will contact you. Below is a flyer for the book. Thanks for posting about Roger's latest book. I picked mine up a few days ago and finished reading it last night. WHAT A PHENOMENAL ASSEMBLY OF AWESOME PHOTOS! The breadth and depth of coverage - ranging from animals / taxidermy to vintage autos to coin op and mechanical music is just spectacular. I urge fellow collectors to purchase a copy -- even if you don't own any of the machines depicted in the photos, you will appreciate the rich historical legacy these devices convey. - And with Dave's great offer, this is truly a no-brainer! What a terrific follow-up to the previous "Saloons, Bars & Cigar Stores"! It is endlessly fascinating to see rare coin-ops as they were originally used. But that's just part of the fun of this book. The large, mostly very clear pictures have a wealth of detail that bring you as close to time travel as is possible. I can, and have, spent 15 to 20 minutes studying a single image. It's impossible not to wish there were some way to jump back in time and walk into some of these saloons and have a beer, or a whiskey, and drop a few nickels into a slot. I'm also intrigued by the lighting. The pictures were presumably taken (for the most part) either with daylight coming in through the windows or with flash powder. But look at the light fixtures -- many gas, some electric, some a combination of both. In a huge percentage of these saloons the minimal lights are very far apart. At night these saloons must have looked downright spooky, with only 'islands' of dim (and sometimes flickering) light cutting through what had to have been somewhat gloomy, even scary, drinking emporium. A far cry from modern bars with "professional mixologists" instead of a nattily dressed bartender. One word of caution: this book is highly addictive and hard to put down! Rodger contacted me the other day and he is running a special on the "American Saloons" book. The temporary price reduction is $39.00 + $6.50 S&H. This is a great book with incredible photos. Now is the time to get it before he runs out. If you're interested in the early days of the American saloon, then look no further than American Saloons, Pre-Prohibition Photographs. Not since my first sold out book, Saloons, Bars, and Cigar Stores, has there been a better, more comprehensive compilation of American saloon photographs. American Saloons, Pre-Prohibition Photographs is a fine, embossed hardbound book that contains over 345 pages of photographs and commentary. The book measures 9 by 12, and most of the photographs fill up the entire page. The book's eleven chapters each focus on different aspects of the American saloon, from the exteriors with their vintage signage and early automobiles to their interiors with amusement machines, front bars, rough characters, and taxidermy. 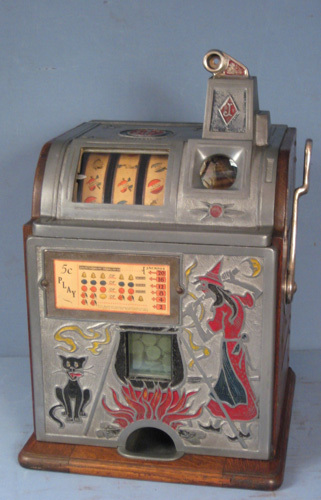 Other chapters focus on the various coin-operated slot machines, venders, and gambling machines that were ubiquitous with the old American bar. Another chapter focuses exclusively on the bar scene “South of the Border-The 1920’s” that thrived during America's flirtation with the 18th Amendment. Many of the businesses featured in the book have been located and some still stand to this day! If you have any interest in vintage Western Americana, then this book is a must have. It's a perfect step back in time, allowing for a visual journey to a wonderful, bygone era. American Saloons, Pre-Prohibition Photographs retails at $39.00 (plus $6.00 shipping and handling). There is a limited quantity of printed books and are available for immediate shipping. They may be purchased directly from my website. Email me with questions concerning dealer wholesale purchases. I just tried to purchase the book through the provided link, but there is a problem when checking out. There are no "shipping methods" available, and the system will not allow you to continue to the payment. Perhaps Roger could take a look at it. When available, I would like to purchase a copy. I had the same issue with the link as well. I contacted the seller and they stated that they would look into it. They also informed me that it was avaliable from them on eBay for $20.00! https://www.ebay.com/itm/American-Saloo ... SwR5dXR932 I bought one and enjoy it very much! i have a favored way of looking at those old photos. i take a big magnifying glass and when you hold it right, it's like you are inside those places. i sold my collection many years ago, but i made sure i got COPIES, so i can still enjoy them.